Carte des Royaumes de Hollande et Belgique. 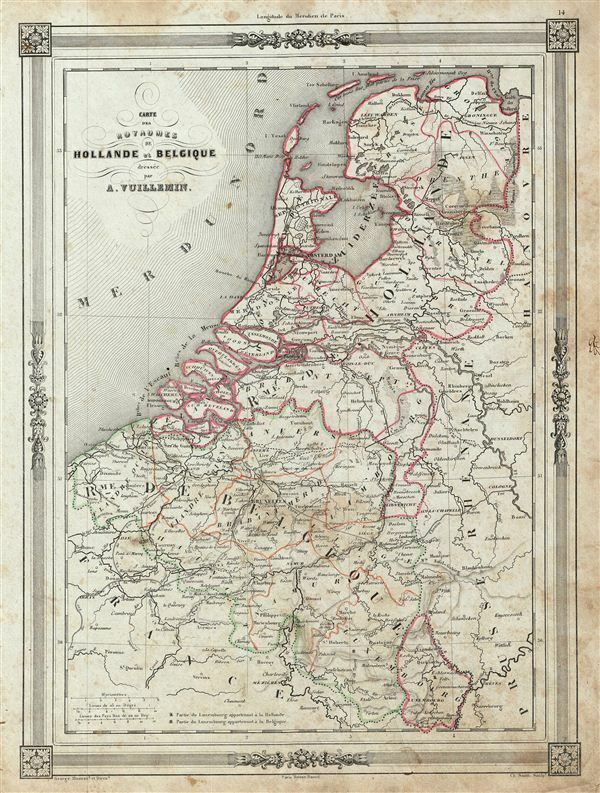 An uncommon and extremely attractive 1852 map of Holland (The Netherlands) and Belgium. The map covers from the North Sea to Luxembourg in the south. Throughout, the map identifies various cities, towns, rivers and assortment of additional topographical details. In 1830, the Belgian Revolution led to the secession of Belgium from the United Kingdom of Netherlands into the independent Kingdom of Belgium. Though Belgium had successfully made itself independent, the Netherlands refused to recognize the new country until the 1839 Treaty of London. The map features a beautiful frame style border. Prepared by A. Vuillemin for publication as plate no. 14 in Maison Basset's 1852 edition of Atlas Illustre Destine a l'enseignement de la Geographie elementaire.